We’ve seen many new Fab Labs and Makerspaces spring up in the last few years that are struggling to stay alive financially. To help create sustainable Fab Labs, the Chevron Corporation has made a generous $10 million grant to the Fab Foundation to launch 10 new Fab Labs in the US. These funds will go beyond purchasing equipment to provide a strong start for communities in which Chevron has operations to develop the Fabrication Laboratories they need for STEM education and economic development. The first two Fab Labs in the Chevron project will be located in Bakersfield and Richmond, California, where it is estimated the facilities will provide approximately 20,000 students and adults a hands-on science and technology experience. The Fab Foundation grant is part of Chevron’s recently announced $30 million commitment and call-to-action to support STEM education. 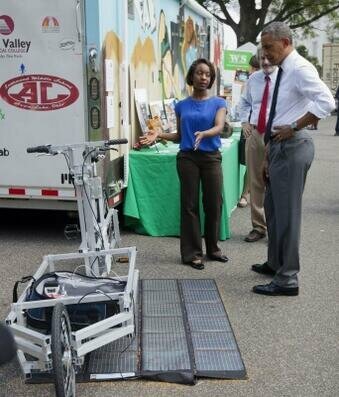 The announcement was made at the recent White House Maker Faire where the Fab Foundation and MIT demonstrated a mobile Fab Lab and numerous cool projects that were made by Fab Lab Network members. The Fab Foundation grew out of the MIT Center for Bits and Atoms where Neil Gershenfeld first taught a class, “How to Make [almost] Anything” and conceived the Fab Lab concept. The Cambridge, MA-based organization is primarily charged with facilitating the growth of the international fab lab network through the development of regional Fab Foundations and organizations. The Fab Foundation builds upon the success of the over 350 Fab Labs in more than 40 countries and shares access to the tools, knowledge and financial means to educate, innovate and invent using the technology and tools of digital fabrication. An excellent case in point are the 2 Fab Labs operated by Incite Focus, where self-sufficient villages are being created using Fab Lab tools. The Detroit-based community group has also developed a cargo bike with a mobile solar charging station for electronic devices that is being used in developing countries to create new micro-businesses. All Fab Labs incorporate 3D Printing, laser cutting, 3D scanning, CNC milling, and electronics building so that there is consistency within the Fab Lab Network. A Fabber could go to any other Fab Lab in the world and be able to jump into making since the tools are essentially the same. “The Chevron grant allows us to give these 10 new Fab Labs a solid foundation,” says Ms. Lassiter, “which we greatly appreciate to lead our next phase of Fab Lab development around the world.” You can read the full news release here to learn more about Chevron’s commitment to STEM education. This week the annual international Fab Lab Network meeting Fab10 is taking place in Barcelona. Watch this space for news about the Fabulous things being reported and use Twitter hashtag #Fab10 for breaking stories!